HERE'S a list of Penny Black retailers. Today, I have to work and take my youngest to the doctor. Looks like she might have pink eye....again. Oye! Oh gosh! Hope Kara is okay! The meds usually help clear it up quick! Your card is super cute and coloured perfectly! Hugs to Kara...surely hope she is better really soon! Thanks for the wonderful creation. I always love what you create! How adorable! You definately want to hug her! Adorable image and great use of the sketch. Sounds like you had a wonderful day yesterday! This card is SO CUTE!! Wonderful coloring as always, too, Denise. Hope your girl can conquer that pink eye. One of my granddaughters kept having it reoccur. Seems to be a tough one to beat. 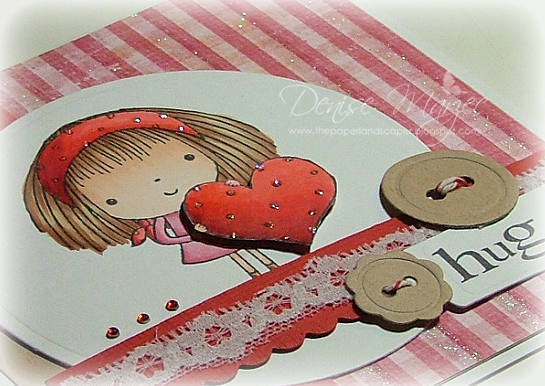 Adorable card Denise, such a darling image! Your card is so adorable! Your day yesterday really does sound like a good one! Hope your little one gets well soon! I'm glad you had a great day, Denise...there's nothing like shopping to make the day perfect!!! Your card is sooo cute!!! I put this set in my DD's Christmas stocking and now me thinks me needs to go borrow it...LOL!!!! Oh my WORD she is ADORABLE, Denise! What a sweet little face!!! Awesome coloring, chickie! A-dorable! 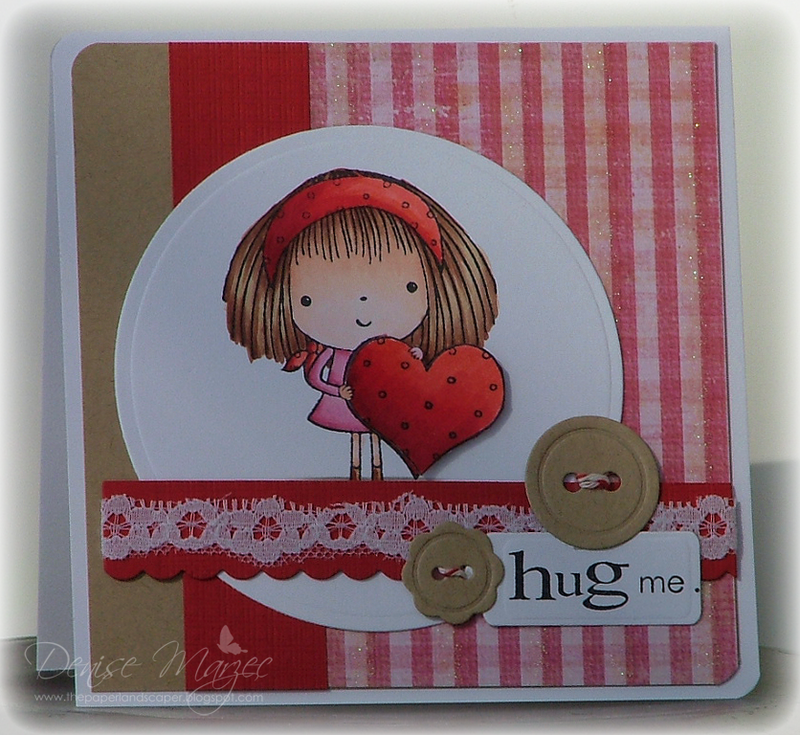 Love that popped up heart and those diecut buttons! Hope Kara is OK! Super cute, Denise! She is colored so beautifully! I love how you popped up the heart and buttons! Hope the little one feels better soon! She is so very cute, Denise! Your coloring looks amazing, and I love your paper buttons!! Oh ...now she's just adorable Denise! I love those cute buttons!!! How darling!! 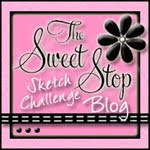 I just love that sweet image and of course your take on the sketch and coloring are stunning!! Too cute!! A-DORABLE!!! That is an awesome sketch and I love what you did with it. Your shading is AWESOME!!! I love her hair and headband. I hope your daughter feels better soon! Awwwww, this is sweet! "Hug me" -- love it! Cool, easy to mail buttons you've got there! So sweet Denise! Great colouring and fab take on the sketch! She's such a sweetie! I love the buttons! This is so pretty!! Love it!! Ummm..Ok has it been THAT long since I visited your blog!?! When did you get a makeover?! Sweet card btw! Love the image! Too cute! Such a gorgeouse sweet card! I love the image and colours.